Cabernet Sauvignon Merlot by Wine By Brad of Margaret River. The palate follows with fleshy, ripe, red and blackberry flavours, gorgeous creamy texture and toasty, spicy oak. Cabernet with Merlot is the way of red wine from Margaret River. Wine by Brad is a fresh and funky wine, fashioned to convey pure Margaret River regionality. There's nothing better than rich, dark chocolate and dense blackcurrant with a touch of mint rounded out by some stylish French oak. As best as possible, Brad wines are made to convey Margaret River regionality, a true expression of the varieties and styles that say Margaret River. But hey, above all Brad thinks these wines provide excellent drinkability for your money in an increasingly crowded world of wine. Among the shadowy figures referred to earlier there is one identity that can be safely revealed. Local guy Brad Wehr is CEB (Chief Executive Brad). He has been involved in the wine industry on Margaret River since 1989 when he jumped the fence at the annual Leeuwin Estate concert to catch a blinding Ray Charles performance. In 2007, following the success of his new label, Brad took a huge leap into the super premium arena with Mantra. Sourcing fruit from Margaret River growers and single vineyard estates, Brad has created small batches of super quality wines under stylish new packaging. So, with a loose master plan and oozing confidence (safely behind the face of Brad), the guys behind the label are pleased to present to you, the Wine by Brad and Mantra series. All wines by Brad use screw cap seals because the guys care about the quality of your wine. Studies by the Australian Wine Research Institute, and research undertaken by wine writers such as Tyson Stelzer, have clearly found that the most safe and effective seal currently available is the screw cap. Wine by Brad is your reward. You know you want it. You know you love it. Goodness knows you've earned it. I mean how hard do you work? Well, pack the day away and revel in a glass of rich and lush Margaret River. Semillon Sauvignon Blanc is the ultimate white blend. You know you want it. You know you love it. In anyone's language Semillon Sauvignon Blanc is a mouthful. From here on we shall call it Sem Sav. This one has the usual tropical pineapple and passionfruit elements, wrapped neatly in scrummy citrus flavours, providing the purrrfect summer cleanser. The fruit comes out of southern Margaret River vineyards. Cool for cats. Chill it, crack it, chug it - with summer salads and seafood and spicy fusion. Cabernet is the red variety of Margaret River. You'll get some arguments from the shiraz dudes but don't pay any attention. There's nothing better than rich, dark chocolate and dense blackcurrant with a touch of mint rounded out by some stylish French oak. 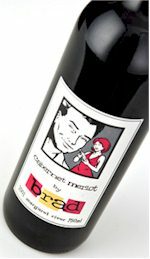 Add a touch of red berried Merlot to flesh it out and Cabernet Merlot by Brad is hard to beat. With fruit sourced from vineyards in the south of the Margaret River region, Brad reckons this is pretty smart stuff. Cab Merlot is classy says Brad. This is gonna do great things this year and you should get some. So is the Wine by Brad Rose. Pretty and pink. Inviting aromas of pot pourri and pear, fragrant redcurrants and raspberry coulis draw you in to the pink charms. The palate reveals a lush and creamy texture with redberried flavours, eastern spices - cardamom and cinnamon - and a long finish. Pink is perfect says Becky. Perfect for picnics, parties, or pleasant afternoons on the porch. Check out the vibrant colour. Enjoy the fragrant aromas of cherry, spring blossom and spice.